There are a number of innovative apps which have been released over the past few months which combine education with visual interactive models. These have usually been specialty specific, focusing on topics such as surgery or cataract operations. 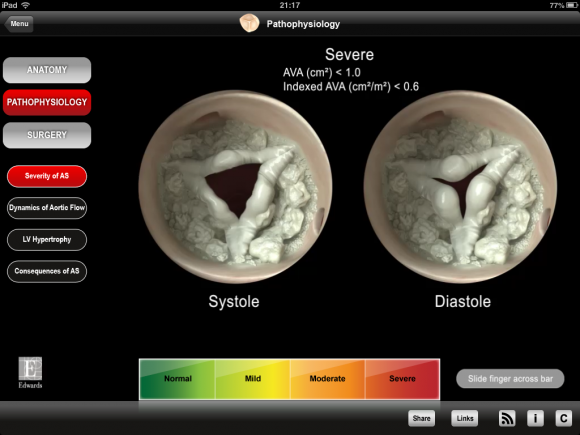 The Edwards Life Sciences group–well known for manufacturing a range of prosthetic heart valves among other things–have recently released an app which focuses on cardiac anatomy, pathology and surgery. 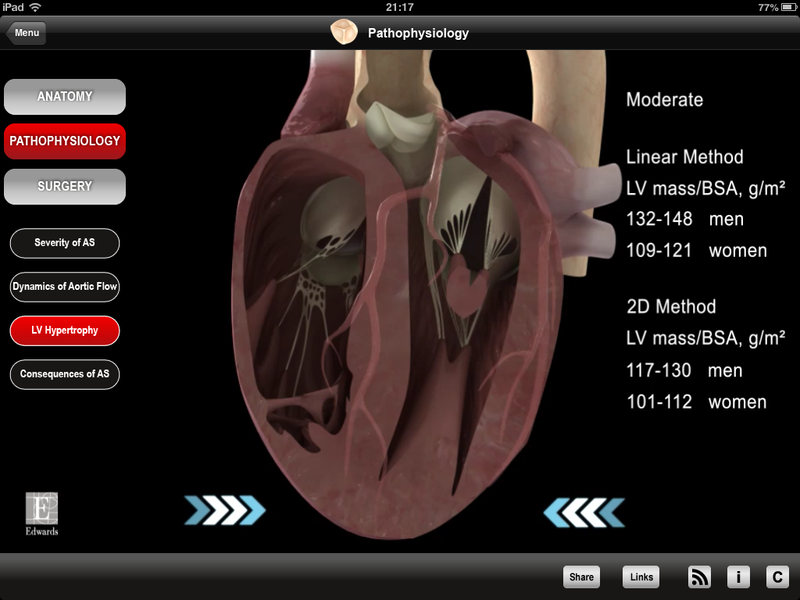 The appropriately named Edwards Heart Master app has three main sections: Anatomy, Pathophysiology and Surgery. 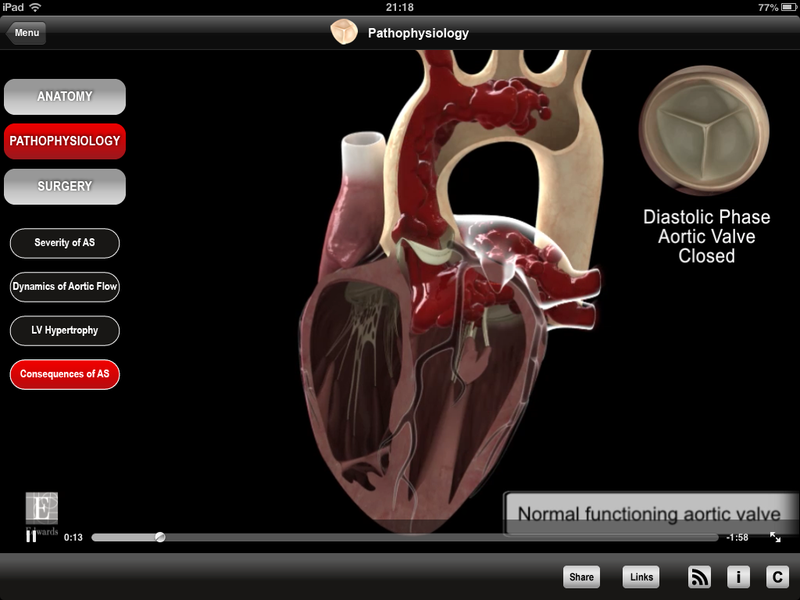 The Anatomy section contains videos detailing the anatomy of the ascending aorta and left ventricle. The quality of the animations is second to none and the audio narration is helpful. The ability to see the structures in three dimensions definitely helps improve understanding of the relevant anatomy. The Pathophysiology section contains four subtopics which are all based around aortic stenosis. It is disappointing that there is such a limited range of conditions discussed here. Although, the interactive features can be applied to many other cardiac conditions. The subtopics are: Severity of AS, Dynamics of Aortic Flow, LV Hypertrophy and Consequences of AS. Selecting each topic brings up an interactive model which can be manipulated using touch gestures to reflect the degree of pathology (see screenshot). 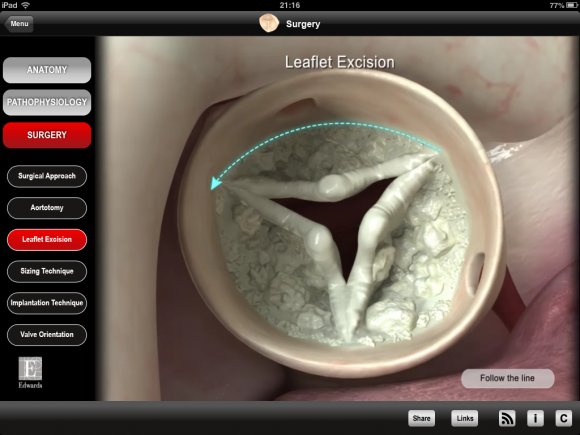 Perhaps the most useful section of this app for clinicians is the Surgery section which contains a range of information related to certain cardiac procedures. Like the components discussed previously, each of these topics contains interactive models which require input from the user. The impressive graphics combine with the interactive approach to truly engage the user. There are many potential uses for this app which all revolve around education. The quality and detail of the content is easily sufficient for medical students and junior trainees with a special interest in cardiac surgery. Medical educators may find the videos and animations particularly useful to engage students. 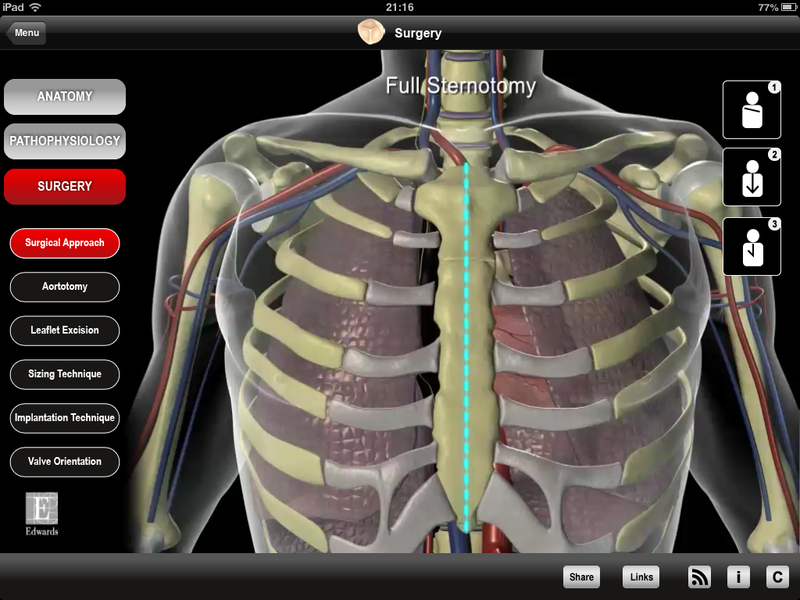 At the same time, senior cardiac surgeons will find this app useful in explaining the relevant procedures and anatomy to patients. Users could potentially take screenshots of the various topics and even email them to their patients, though, it should be noted that this feature is not built into the app itself. While the range of specific pathology is somewhat limited, the animations and explanations are applicable to many scenarios. 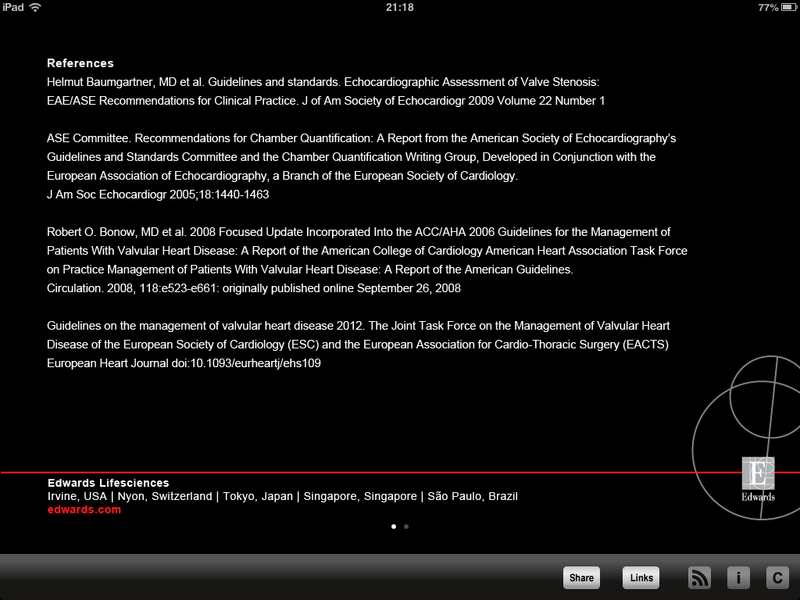 This app is completed by an appropriate reference section containing the details of the papers used throughout. Currently only has pathology of Aortic Stenosis, and LV hypertrophy. Would be keen to see more additions to this in future updates. 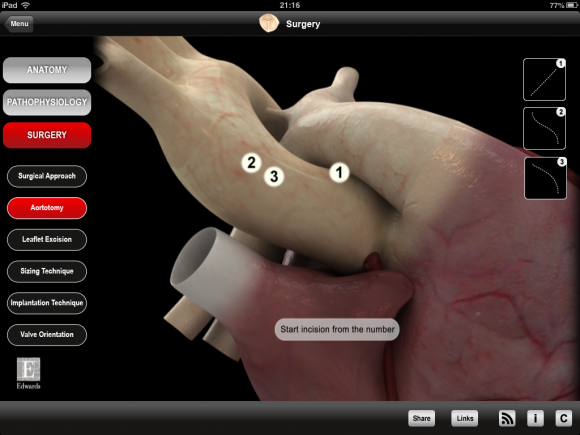 This is an essential app to download for cardiothoracic surgeons as it will help them explain procedures and anatomy to their patients. The quality of the content and use of interactive media is to be commended with perhaps the main drawback being the limited range of content. Hopefully, future updates will continue to enhance the range of content available thus improving overall utility. This looks like a fantastic app, but it appears to be available only in the UK app store.